Have you ever wondered what it would be like to be the GM of a big company, even for a short period of time? 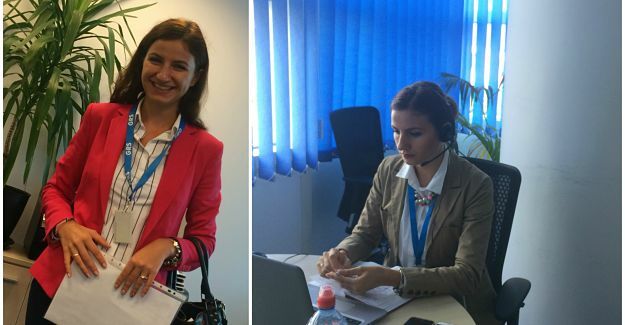 Ioana Radulescu (IR), one of our Project Managers, wanted to find out so she did her best and won a contest that allowed her to do so. At the beginning of this year, we organized an internal competition for our employees, meant to help them change their focus from their daily tasks. The contest required the participants to make a short 2 minutes video in which to speak about their experience in GRS. The winners participated at courses paid by the company and chosen by them. Q: Ioana, what motivated you to participate in the contest? IR: I had more than one reason to do it, so I will just give you the first three: I like to get involved in new projects, I am very curious and I loved the theme of the short movie we had to make. I have been working in GRS for more than 5 years, so I had a lot to say about my experience with the company. Q: How was the experience of being our GM for two weeks? IR: I started with so many things on my mind; I did not want to intrude or to be a pain in the busy schedule of Cosmin, our GM, but he was very open and told me this will be a teaching experience for both of us and that I should not worry. There were many new activities for me and each of them taught me something else: negotiation, contract analysis, budgeting and networking. I also had the opportunity of going at the ABSL annual conference with Cosmin and our colleagues. It was great to get first-hand information about our industry. IR: Yes, definitely! I learned many things and I turned to my usual position with many new ideas for my team. Moreover, now I understand better what it means to be a General Manager. Cosmin was very transparent and supportive, now I perceive him differently. I had the opportunity to see things from a completely new perspective and understand better the man behind the position.